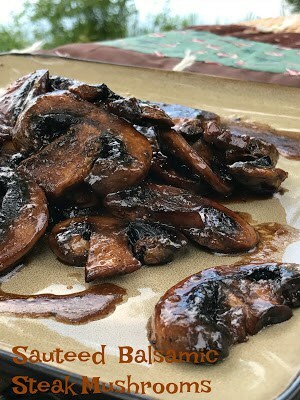 Balsamic Steak-Cut Mushrooms are extra thick, large sliced mushrooms that are sauteed in a mixture of butter, oil and balsamic vinegar. Montreal seasoning and sea salt adds just the right amount of spice. 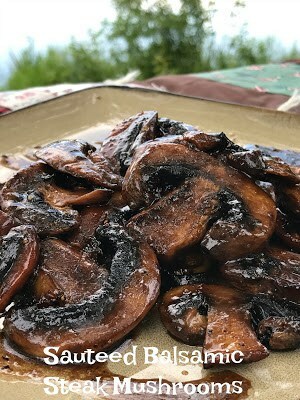 The mushrooms are perfect served over grilled steak or grilled chicken breast. Heck, they’re great spooned over a grilled thick hamburger too. 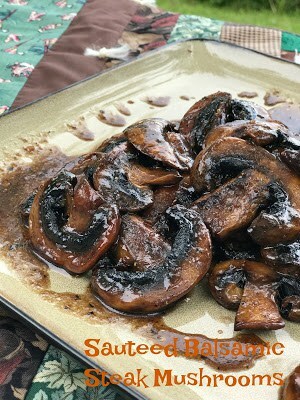 Balsamic steak-cut mushrooms are fast, easy and delicious. The perfect side dish to any meal. There are literally thousands of varieties of mushrooms. Sizes and shapes vary tremendously and colors range from white to black with a full range of colors in between. The cap’s texture can be smooth, pitted, honeycombed or ruffled. Flavors range from bland to rich, nutty and earthy. The cultivated mushroom, such as the white button mushroom, is what’s commonly found in most supermarkets. Mushrooms are available canned, frozen or freeze-dried and dried. Canned mushrooms are available in several forms including whole, chopped, sliced and caps only. Dried mushrooms are available either whole, in slices, bits and/or pieces. 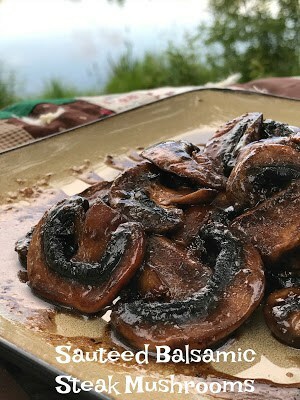 Depending on how you are going to use the mushrooms make sure to purchase the type of mushroom you need for the recipe. Mushrooms are one of nature’s most versatile natural foods and can be cooked/used in almost anyway imaginable. Balsamic Vinegar [bal-SAH-mihk] Italian Balsamic Vinegar is made in and around the areas of Modena and Reggio-Emilia. It’s produced from white Trebbiaano grapes, the must of which is cooked and concentrated until deep, dark and rich. The vinegar continues to gain its dark color and pungent sweetness from a lengthy period of aging in barrels of various woods, such as chestnut, juniper and mulberry and in graduating sizes, from larger to smaller as the vinegar ages over a period of years. Many balsamic vinegars contain sulfites, which are added to inhibit the growth of unfavorable, flavor-detracting bacteria. Balsamic Vinegar ranges in age from young (3 to 5 years), to middle-aged (6 to 12 years), to the noble older versions, which can range from 12 years to over 100 years old. By law, a vinegar labeled aceto balsamico tradizionale di Modena must have been wood-aged for a minimum of 12 years. The word stravecchio on the label tells you the balsamic’s been aged at least 25 years. Older, high-quality balsamics are sometimes used as an Aperitif or Digestif. Delicious served over grilled meat, fish and poultry. 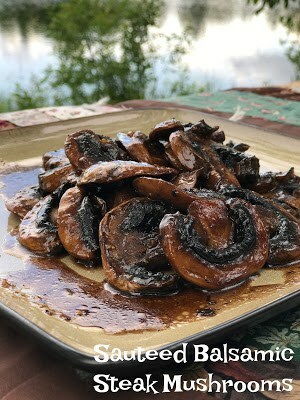 Wipe sliced mushrooms with a damp paper towel if necessary. In a large skillet or saute pan heat oil with butter over medium heat until hot. Add mushrooms, keeping mushrooms in a single layer if possible. Season with Montreal steak seasoning and sea salt. Saute' mushrooms for 10 to 12 minutes, turning mushrooms over with a fork, until mushrooms are golden brown. Add balsamic vinegar, simmer mushrooms 20 minutes longer or until mushrooms are tender and have adsorbed some of the butter/vinegar mixture. *Information from the book: The New Food Lover’s Companion, 4th Edition.